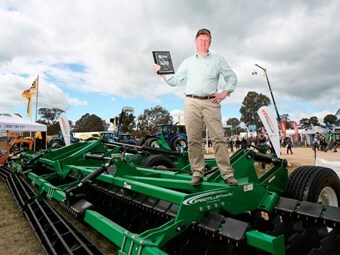 K-Line’s new one-pass tiller that answers to clogging issues in the soil has taken home the Tractor and Machinery Association of Australia (TMA) award at the recent Henty Machinery Field Days. The award recognises the best new Australian designed and built agricultural machine and was judged by Henty Machinery Field Days directors. It was presented by TMA member Scott Maxwell and Henty Machine of the Year chairman Matt Bergmeier to K-Line Agriculture national sales manager Bill Larsen on Thursday, September 24. "It is a credit to our design team and Australian farmers buying out machines to win the TMA Award," Larsen says. "We have sold one machine and have a lot of good, strong quotes out there." According to K-Line, its award-winning Speedtiller Powerflex is the only Australian built compact disc tillage machine. Larsen says the Powerflex took two years of fine tuning, and is a direct response to rollers clogging in wet sticky soils. "Forward placement of the wheels gives the operator the ability to take weight off the rollers without affecting the Powerflex’s ability to flex and follow the contours of the ground evenly," Larsen says. "We are finding farmers who have zero-till direct drill programs are finding chemical resistant weeds, and pulling back on strategic tillage," he adds. "They want a one pass tillage tool and the Powerflex has filled that niche." Larsen says the 12.5m machine was built to handle heavy Australian conditions. "We find our competition typically out of Europe and North America are lighter as they don’t need to dig as deep, and they are generally running with more moisture in their soils," he says. "Our soils take more penetration as they are drier. "A farmer can use the Powerflex for shallower cereal and canola stubbles, and also for heavy duty work typically using a tandem offset disc." Larsen says the Speedtiller Powerflex requires a 550hp tractor to run at a maximum of 12km/hr and at a depth of 12cm. "The hubs of the jump-arms were non-greasing and discs simply changed with a rattle gun, resulting in ease of maintenance," he says. Other features of the Speedtiller Powerflex include wider spacing between front and rear discs for increased trash flow; adjustable wing pressure, rollers that can be floated to reduce sticking in soil; and the ability to fold down for a narrow transport width.